Chunk is Looking for a Special Home! 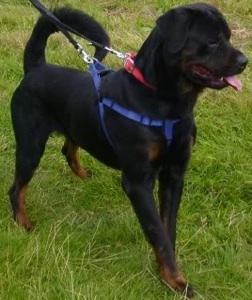 Please meet Chunk, a Rottweiler, male, approximately 2 years old. He is large in size with a gorgeous full tail. Chunk was signed over to the pound when his owners could no longer keep him and we have been looking for a rescue space for him since July. Sadly no space has become available for him as yet, and as he has been with us a while now we have been able to assess him and we have started to look for the right loving forever home for our Chunk. 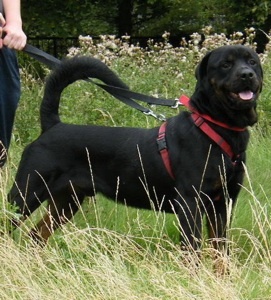 Chunk is gorgeous, a big handsome soft lad with a gentle nature who also gets on with other dogs and has a happy friendly temperament and a good range of rottie 'chatter'. Chunk has neurological damage which results in him walking with a very high stepping gait and he sometimes looks to be a little off balance - not that this bothers him! He has been to see the vets who think this is as the result of a brain lesion - a damaged part of the brain caused by an old injury/untreated infection in the past or perhaps just something he was born with. The vets think this will not get any worse (or get better) as Chunk gets older. Sometimes it also seems as though Chunk is not quite sure what is expected of him and can look a little bewildered! Chunk does have a good temperament and we would love for him to find the right home where it doesn't matter how he walks or if he doesn't quite understand something! We are looking for a home with someone who has breed experience and where any children are 14+. Any prospective owners will be homechecked and would need to be happy to travel and meet Chunk with all the family. Chunk will be neutered, vaccinated and microchipped prior to rehoming and we offer a lifetime support. If you would like to find out more or are interested in offering Chunk a home please call Emma on 07799 777422 or Contact Us.